I have just been contracted by the very serious quarterly review: "L'Egypte", which does articles of very high quality. They have asked me to be their official special correspondent in Egypt, and I will be writing articles for each of their publications as from July, about the last archaeological discoveries. This was lacking and I am very happy to be doing it. I will be even more criss-crossing the sites! And you will be informed almost in real-time of the last findings and of their meanings! I like this collaboration because it is a highly ethical review, whose editor is a real expert of Egypt, as well as an exceptional collector of egyptological books. The photographic fund of the review and of his Foundation is beyond comparison in Europe, and I will be enriching it with great pleasure. And of course I carry on with my Chronicles in Top Secret. 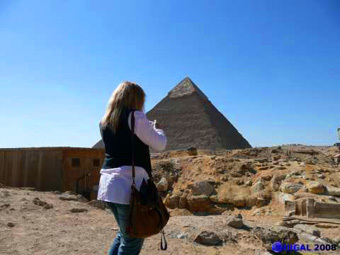 Dear friends, here I am, back from South of Egypt! I have reached all my goals, including the most difficult ones, and we will be speaking about it during our trip. In the meantime I have made up for you a very short video-clip which gives you the atmosphere. I will rest for a little while and then you will be able to read me again. Here is another glimpse of this 2d Dynasty monument near Abydos, at the feet of which are buried the oldest ships ever found on Earth. 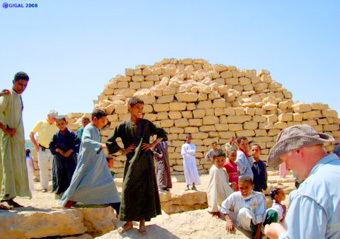 Besides, well-known arachaeologist David O'Connor hasn't hesitated to link its huge walled closes in the middle of the desert, to the "Gods' fortresses" mentionned in very ancient inscriptions, where are mentionned the ceremony places for the Shemsu Hor (circle of Horus). I have shown to my cirlce some of the 415 tombs of the Ancient Empire's princes and dignitaries, who guarded the "South Door". These really touching tombs, dug in the steep rock, contain brightly coloured frescoes concerning daily life, as well as biographical texts. However I had another reason to come back to this place. 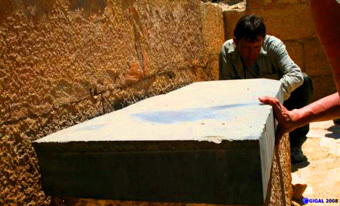 I had been told that Senemut's tomb had recently been rediscovered. The great architect and dignitary of Hatchepsut (1473-1458 BC). 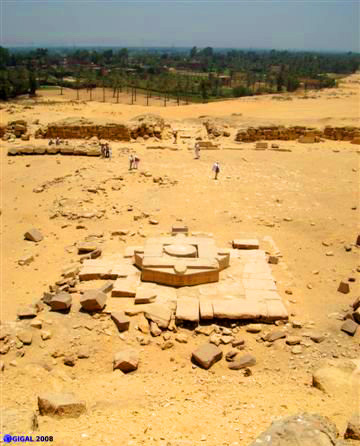 More precisely, his second grave (effectively it was common for the dignitaries to have two graves, one of which being empty): the first one TT353 is located near Deir el Bahari, it is and amazing one with its astronomical ceiling, so intriguing to many, containing the Horizon's constellations and decans. The most ancient representation of Egypt's austral and boreal sky. But there, it is question of TT71, the second one, and even if this small tomb is in a very bad state I had to get closer to it. Here, we are in front of Kula's little pyramid (15 metres high), in South of Egypt, 6 km north of Hierakonpolis, in a small isolated village not far from the Nile's banks. Discovered by Vyse and Perring in 1837, its construction is attributed either to Pharaoh Snefru or to Pharaoh Huni. 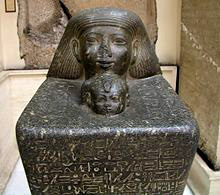 In either case it is known that it goes back to at least the third Dynasty 2780-2680 BC). Carefully observe the left corner of this picture I took, you notice in the fault two layers of floor covering. On site, I noted that apart from an uneven ornemental tiling situated high up in certain areas, like old roads, the whole ground under this pyramid is made of two immense superimposed horizontal platform stones; apart from cracks and natural faults, each one seems to be of a single block... 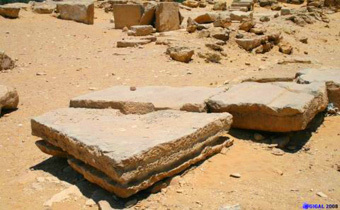 This strangely looks like the huge platform stone surrounding and under the Sphinx in Giza... Besides, a question arises: why a single pharaoh would have built about seven small pyramids without interior rooms, along the Nile...?" 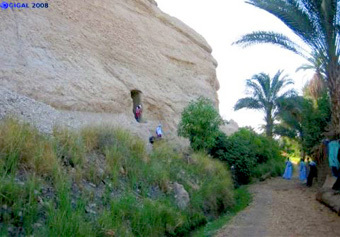 To reach this small tomb one has to climb a sheer rock face, not far from Gebelen, south of Luxor. 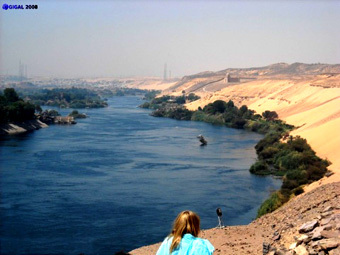 Few people have the chance to get to this heavenly place, remote from the world, on the edge of the Nile. Yet it was without any doubt an extremely important place already at the time of Imhotep. 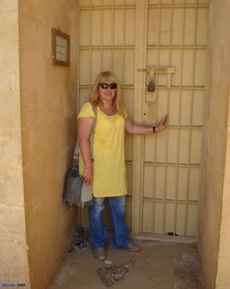 The Serapeum door has just been opened in front of us. Here we are, back home! 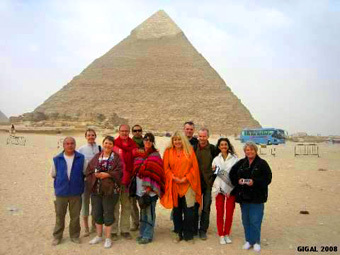 The group has been awesome and the journey to Giza has been packed with exceptional experiences and emotion. 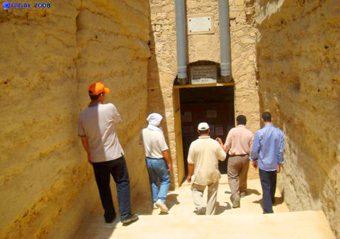 Thus we could go down into the Serapeum, in spite of the untimely official decree strictly forbidding the site's entry for security reasons, even to those, like me, with a special pass. Indeed, a week before our arrival, there had just been made extraordinary discoveries in the site's very entrance: several levels of endless undergrounds containing many more sarcophagus... and as the tunnel was crumbling under the recent excavations, the structures had to be reinforced for the security of the rare privileged ones allowed to access this magic place. By calling on some of my relations in Cairo, who have had to interfere during several days, we could at last enter the place. This has given me once more the opportunity to note the high reciprocal respect the Egyptian authorities honour me with and I am grateful to them for that. Observation: many things have moved in the first entrance room inside: shifted sarcophagus, covering of all the sarcophagus with plastic and reinforcement of the stone structures everywhere with a horde of workers bustling about, and at last concealment under planks of new underground accesses. During this last visit, I have noticed plenty of brand new archaeological elements, such as this double staircase just recently discovered at the feet of Pharaoh Senustret II's Illahun Pyramid (12th Dynasty) in Fayoum. 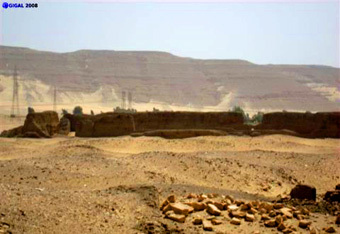 It has been very touching to discover two different access ramps, one next to the other, that went up from the place where was located the water of the artificial lake Moeris (built by Amenemhat III), to Illahun's structures, with a different angle, sign of a gap between two epochs unaware of their mutual existence. 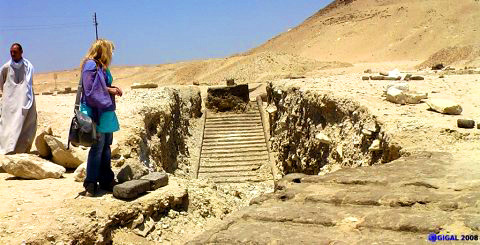 How come the first staircase got completely buried and forgotten in the most recent period, and most of all why does the first staircase seems much older than the 12th Dynasty? 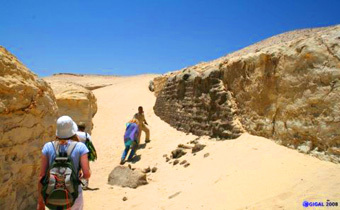 There, we have just entered the Niuserre complex closed to the public in Abusir, Osiris'land on Giza's plateau. Many rare and interesting artefacts can be found there. Look at this huge slab in the foreground, scratched at its base by a deep slot. I gather that this slab is the wrong way round, turned upside down, and that the slot allows the overlapping of another slab, the latter maybe leaning according to a different slope; and why not a water conduit beneath it all. Look at the bottom picture, just a bit further away, there are three smaller slabs, but two of them, behind the first part in the foreground, are the right way up: they bear ditches for the flow of liquids such as water. All the area is about water distribution, numerous alabaster pools with evacuation can be found, as well as many ditches dug in the rock here and there. 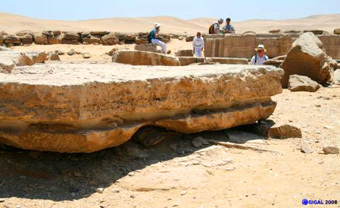 All the slabs on this site, which peak was during the 5th Dynasty (2510 - 2365 BC), evoke a big sophisticated "Lego" game where lustral water must have played an important part. 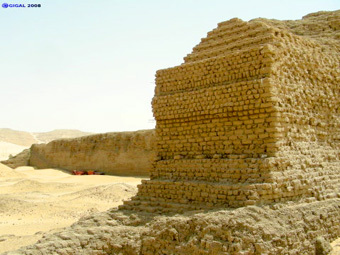 "While our small group slowly moves on behind the mastabas North of Illahun Pyramid, the officer helps me to get closer to a surrounding wall made of rough brick. This brick wall is very touching: not only is it very old (going back to at least 1882 BC) but it has perfectly stayed in place since, against the tide. The brick by itself is very heavy (I felt the weight of one of those: I estimated it weighs a little more than 3kg, though it doesn't look like it! ), made of extremely compact black earth with vegetal filaments. If you look carefully at the bottom picture, you will notice that between each four rows of bricks there is a light reed or papyrus straw layer. 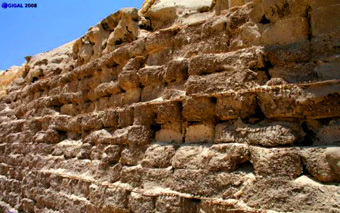 The ancient ones on site explained to me that these straw layers between the brick layers greatly help the wall strengthening. The straw catches every single bit of humidity in the desert at night and swells, thus allowing the wall to adapt to the extreme climatic differences in the desert. It is simple and sophisticated at the same time. This brick section was without doubt sinusoidal and was maybe in front of a stone wall protecting the whole place. Only the brick wall remains today..."
In Abusir, Osiris' close, his sacred place, there is an incredible black stone in the middle of a maze. Experts have tried to work out its composition, its origin: no one gets to know what it really is. It is about 1m50 length, of a rectangular shape, soft and smooth to the touch, and is impossible tu cut. Besides it is amazingly light (only a few kilograms) and gives a curious sound when one hits it. Apparently, the archaeological area's head says that this stone doesn't look like anything on Earth and doesn't come from a meteorite either... It is one of the mysteries I like to share, having this closed site opened for you. 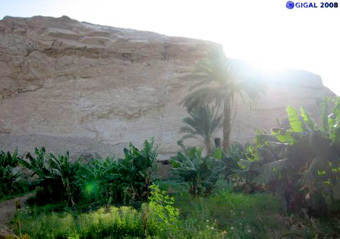 Giza, December 2008, in front of Chéphren. 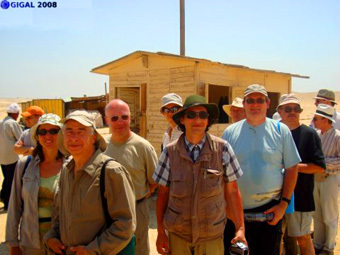 "Plenty of great discoveries during our last trip to Giza, and a terrific study group at all levels. Still more excavated quays in Hawara, a serapeum which inside has changed a lot as it is being renovated with new chapels, a lot of undertaking in Sakkara, Meidum full of children for the feast, a newly excavated pyramid in Abusir, the site of Giza completely empty just like a few years ago (becuase of the feast), and many more things as well. I could enter for the first time in Sakkara's south tomb (closed to the public) with its sublime blue tiles; I could go once more to Abu Rawash, to see yet another time the famous staircase, and to gather some important information as well as to visit the 2d and 3d Dynasties tombs' site... A lot of articles in prospect ! One thing is certain: my researches all come together and will enable me to draw you a fascinating picture of Ancient Times in Egypt."